"I always wanted to make that game based on everything I enjoyed as a kid. This is the end result." 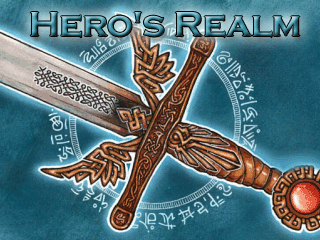 Hero's Realm is an unapologetically old school endeavor made by kentona . It's a homage to old school Final Fantasy and Dragon Quest games, made in RPG Maker 2003. You lead four heroes and their allies on a quest to rid the world of the Lord of Demons, Mephistocles. Over the course of four chapters, you take four pre-determined heroes and twelve characters you design yourself (three under each hero) across the land, performing great deeds and eventually meeting up to become one gigantic demon extermination squad in the fifth chapter. In the final chapter, the game opens up and you can find ancient artifacts and purge the world of evil as you will. Always Chaotic Evil: If it looks at you funny, you should probably kill it before it tears you apart. And Now for Someone Completely Different: The first four chapters of the game have you playing as each of the four heroes before joining up in the fifth and final chapter. Baleful Polymorph: What happens to everyone in Tyrsis. They get better. Bittersweet Ending: The heroes triumph but the ENTIRE Army of Light is wiped out in a single attack and The Chosen One, a twelve year old girl, dies. Ouch. Bonus Dungeon: The final chapter of the game is very open-ended, with several bonus dungeons. But Thou Must! : Being inspired by Dragon Quest means that this was a given. Card-Carrying Villain: EVERY single antagonist fits the bill, but special mention to Niddly Wormwood and Balthalas, who sports an excellent Evil Laugh as well. Combat Medic: The Paladin and Templar classes are warriors with access to healing magic. Darker and Edgier: The fourth and fifth chapters. The fourth starts with a frighteningly subverted positive moment and the fifth has some of the gloomiest moments in the game, including the Bittersweet Ending. The Dragon: Balthalas appears to be this to Mephistocles, but nobody's really sure. Dude, Where's My Respect? : Moments after being told that your heroes are the most badass in the entire world, you're sent on a Fetch Quest across the entire globe to track down the ultimate equipment...so someone else can use it. Evil Sorcerer: The first of Mephistocles' henchmen is one. Expy: Three of the four heroes are very much so, even using the graphics of similar characters from Final Fantasy IV. Rydia portrays a wizard, Edge is used for a young ninja with dead parents, and Yang is a stoic monk and respected member of his monastery. Oddly enough, the first hero uses Faris's sprite with blue hair and is only similar in appearance. The Family That Slays Together: The Wormwoods. Game-Favored Gender: Females are provided with many more sets of armor than males. Examples include the "Leather Dress" offering more defense than the gender-neutral "Leather Armor", and female spellcasters having access to the "Silk Robe" while males get nothing in comparison. Hello, [Insert Name Here]: Your hero characters and their teammates. Heroic Mime: Our heroes. Played Up to Eleven. Homage: To Final Fantasy and Dragon Quest III in particular, but also to old school Role-Playing Games in general. Horny Devils: You can travel to an isolated, snowy island populated by a single scantily-clad and seductive duchess. Inevitable Tournament: The entire third act builds up to one. Totally justified, as the hero is entering it to avenge his father's death. Infinity +1 Sword: The Lightsabre. Some of the heroes' ultimate weapons could qualify as well. Lazy Backup: If one party gets wiped out, every party gets wiped out. Even in boss fights where switching parties is essential to strategy. Magic Knight: All of the four heroes can use magic and weapons with equal skill. There's also the Black Knight class, which can use offensive magic, and the Templar/Paladin, who can heal your allies and dish out damage to undead. The Man Behind the Man: Mephistopheles. Names to Run Away from Really Fast: Mephistocles. And Murzhor. Nice Job Breaking It, Hero! : The heroes open the gate to Mestophicles' prison so the Army of Light can take him down. This allows the Big Bad to send out a massive monster that wipes out the entire army. Party in My Pocket: You eventually control sixteen characters at a time... that take up a single tile. Played more normally in split-path dungeons, where you have four parties of four characters each represented by a single graphic. Rare Candy: There are lots of seeds that increase your stats, much like Dragon Quest. Sealed Evil in a Can: Mephistocles and his henchmen. Wait, so how did Mephistocles' henchmen escape if he couldn't? They were able to escape because the Sultan of Indhopal made a deal with Murzhor that freed Murzhor from his prison. Murzhor took the Sultan's place and freed the rest of Mephistocles' henchmen. Dragon Quest IV: The first chapter of the game is very reminiscent of the first chapter of Dragon Quest IV. Numerous children have vanished and it's up to you to investigate their mysterious disappearance. The Gurus meet in Paranor. There's also Elfstones and a city named Aborlon. There's a stealthy one to The Simpsons in Cidney. "I see you've played knifey-spooney before!" The fifth chapter has some parallels with The Wheel of Time. In the second chapter, when the people of Tyrsis have been turned into animals, the one remaining guard explains the situation to the player. He starts by quoting the Toads at each of the King's castles in Super Mario Bros. 3 verbatim. Silent Protagonist: All of the playable characters. Squishy Wizard: Played straight in most cases, except for the Magic Knights mentioned above. Firmly averted by Zefiryn, who is a wizard AND a werewolf to boot. Think of the Children! : The title of the first chapter. It's fitting, given the morally questionable things you do in order to rescue said children. This Cannot Be! : Murzhor is quite found of yelling this, which is fitting considering his role as the Evil Genius. Balthalas utters this at least once as well. The Quisling: Prince Kenji of Jomongo. Doubles as a bit of Fridge Horror if you speak to him in the third chapter and learn that he...desperately wants to join the Army of Light. It becomes a You Monster! in chapter five when you learn that he allowed Balthalas to enter the largest city in the world and create an army of dead that wiped out Kenji's own family and most of the citizens.